I’ve been at the beach place over the weekend and although it appears that I’ve been relaxing, looks in this case can be deceiving! 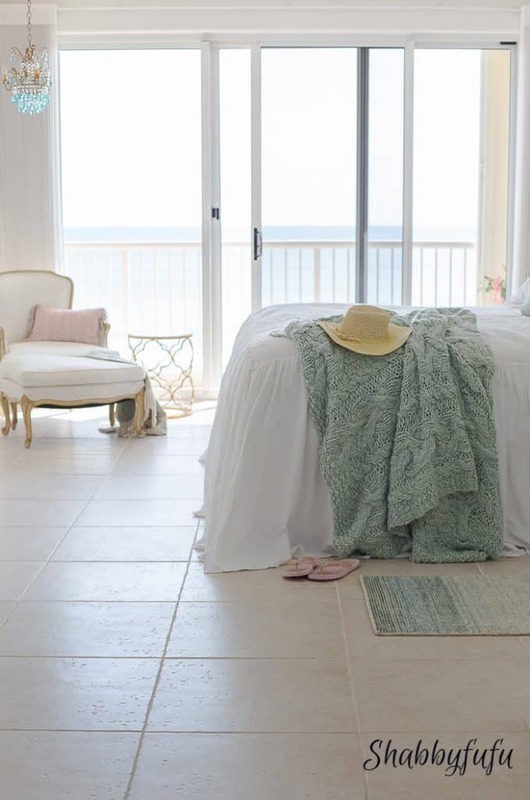 We have taken on a lot and that includes working on some remodeling at the Miami house as well as the beach place (as it’s become affectionately known on my Instagram page:-), but when you have a place on the ocean it’s relaxing just to breathe. So with my well worn flip-flops and old straw hat I head outside for any moment that I can grab. A quick toes in the sand and I’m back inside and working away on some BIG updates to share soon! Big…as in, we’ve neglected this place as a second cousin for far too long and now it’s time to give it the love that it deserves! Still not finished with the Master Bedroom that I talked about in the French Modern post, I love all of the white and am not planning on making any changes to the wall color or the furniture but am still on the hunt for something else to hang over the bed and a furniture piece for the wall that is opposite. I’m one of those design types that has ALWAYS kept eyes wide open when out and about and when I see the right piece for a project I just KNOW it! Like this scrumptious, thick and soft as a baby’s tush Robin’s Egg Blue throw from The Artisanal Collection at Annie Selke’s Pine Cone Hill . 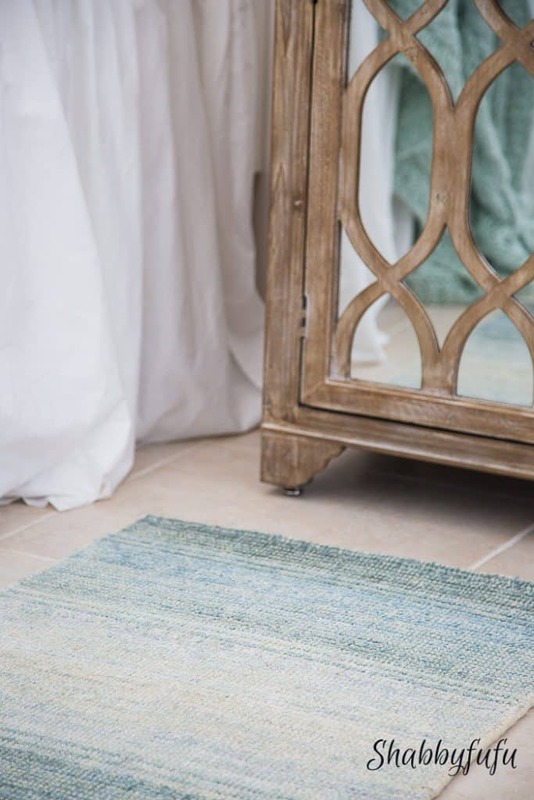 The color is perfection not just for a “beach place” but for the spring season in any home! If this color isn’t your jam it’s available in Grey and Slipper Pink and I’m thinking that I need one of each for different rooms and looks. 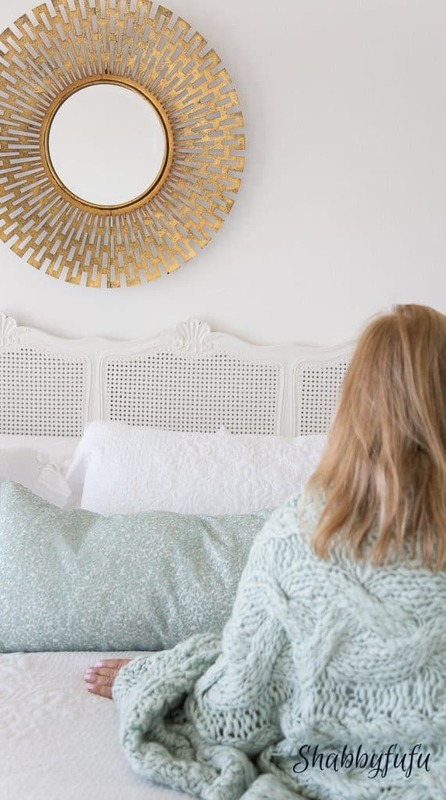 A new throw, a pillow, a rug…these are how I change up a look in a room without a complete redo and for the seasons! 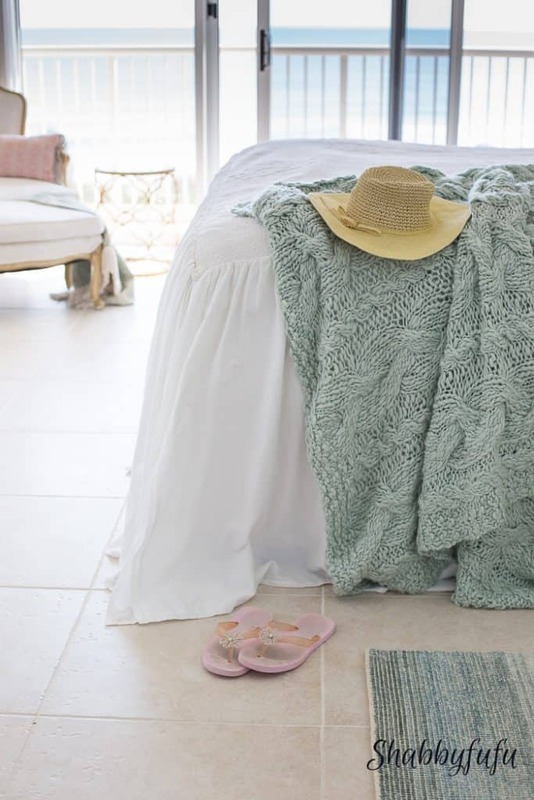 Cable knit throws are timeless and traditional and this color is updated and oh so soft. 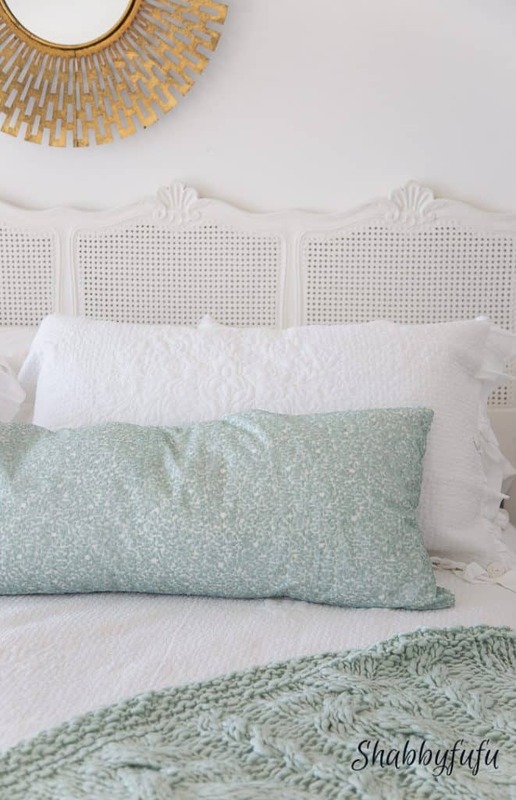 I’ve cocooned myself in it plenty during the working weekend at the beach and it’s sitting with me in front of the beautiful Glaze Sequin Robin’s Egg Blue Decorative Pillow that adds a touch of chic-ness to my bed. Closer details on the pillow. 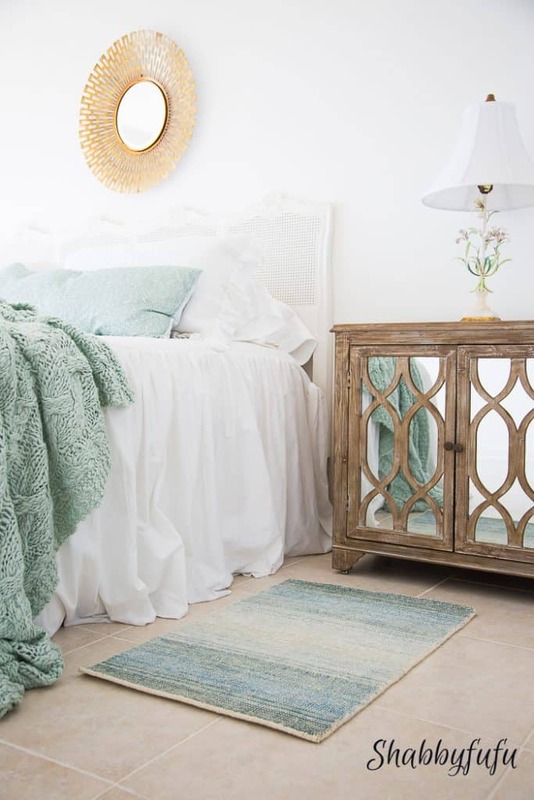 The lamps are vintage and a little under scaled for this room with the new-ish mirrored chests, so I’m moving them to one of the guest rooms that I’ll be posting soon and super excited about! Shopping my own home certainly keeps things fresh. Next on the tour is my sweet friend Summer who invited me to participate and I just know that you’ll LOVE her style…so pop on over to visit Summer Adams Design and the rest of the bloggers! I have another tour coming tomorrow….it’s a big one and I’m so excited, so I hope to see you then friends! 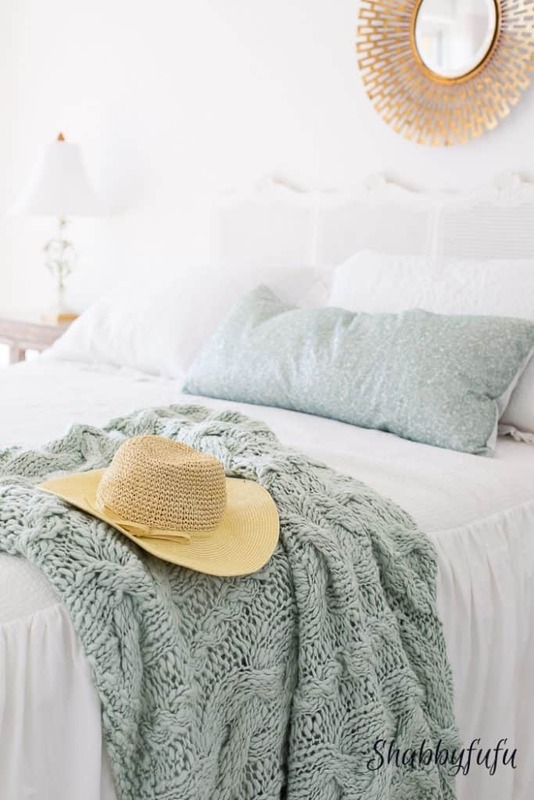 Where did the white ruffled bed cover come from? From Soft Surroundings, but sadly it’s no longer available.